Beginning in October employees at Starbucks, the giant coffee retailer, will be taking home about 5 percent more money in their paychecks. 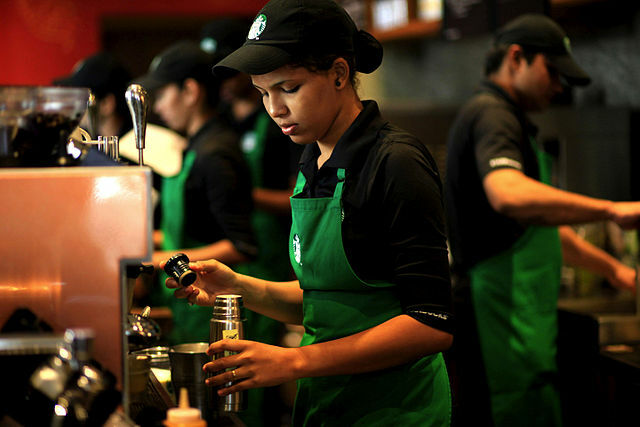 Howard Schultz, CEO of the Seattle-based company, sent a letter to workers last week explaining that the exact amounts of the raises will be determined by market as well as geographic factors. There are about 7,600 Starbucks across the country. The company does not disclose the exact amounts of starting salaries for their employees, saying it is based on the specific market factors effecting each store individually. Wages that companies pay for entry level jobs has been an important topic for candidates this election year. The Democratic Party policy platform will most likely include a desire to see a $15 federal minimum wage slowly implemented. Republican candidate Donald Trump has said he prefers the issue of minimum wage be left to individual states to decide. I addition to wages, Starbucks employees have been demanding that the company give them more predictable and reliable working hours. A petition advanced by a Starbucks employee said that the company was reducing work hours to save on labor costs. The petition said that it is almost impossible to work more than a 25-hour work week, and that the cuts in labor was having a bad effect on worker morale and customer service. Schultz, who has been in touch with Jaime Prater, the employee who started the petition, said that Starbucks is ready to work with their employees to give them the hours that they need. He added that the company was committed to helping its employees find the right schedule which will insure that they are entitled to worker’s benefits.